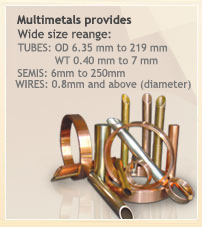 Multimetals was founded in 1962 as a joint venture with Revere Copper and Brass Inc., USA. Today, we are premier manufacturers of seamless extruded copper, copper alloy products including 90/10, 95/5, & 70/30 Cupro Nickel, Cunifer, Aluminium Brass, Admiralty Brass, 70/30 Brass, 63/37 Brass, Naval Brass confirming to various international standards. With our wide product range we cater to numerous industries like Air-conditioning, Refrigeration, Heat exchangers, Nuclear and Thermal Power Plants, Ship Building and Repairs, Petroleum refineries, Sugar Plants, Defense establishments i.e. Naval Warships etc. We have a technical collaboration with M/s Hitachi Cable Ltd., Japan, one of the world leaders in Air Conditioning and Refrigeration Copper tube technology. The distinguishing factor about us is the quality of our products owing to which we have won 13 Export Excellence awards since 1993-94. 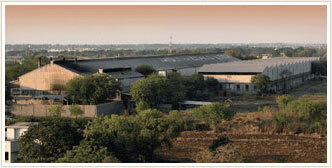 Multimetals is an ISO 9001:2008 certified company with its works approved from Lloyds Register. We possess PED Certification and self-certification AD 2000 Merkblatt W6/2 from TUV Nord. Apart from the Standard products, we have also started manufacturing other copper based alloy semis in the form of hollows, sections, profiles and rods as per customers’ requirements, custom made as per the chemical, mechanical, metallurgical and physical properties provided by the customer. We also offer PVC Coated Tubes and high performance copper alloy wires, adding to our product range. Fortified by our dedication for excellence and renewed commitment to quality and growth, Multimetals has every reason to be optimistic about its future in the Non Ferrous business in India and Abroad as well.